The Commodore Clipper is a purpose built conventional ferry designed for a year round, all-weather service. 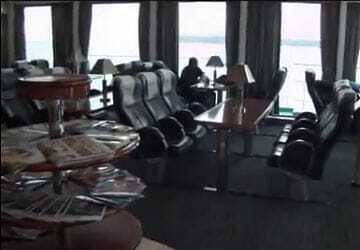 This well-equipped ship has space for around 300 passengers and over 100 cars. Onboard facilities include en-suite cabins, reclining Seats, a brasserie, a lounge bar, duty free shop and a children’s area. There’s a range of comfortable cabins available on the Commodore Clipper, all offering en-suite facilities. In addition, there are 2 cabins with disabled facilities which are accessible by wheelchair. In terms of seating, relaxing reclining seats are available for a small supplement. For a bit of extra luxury and affordable comfort, book a Condor Ferries Club Class seat. These seats are in a private lounge area featuring tables for work or relaxation, a steward service, complimentary newspapers and a selection of snacks and hot drinks. The Commodore Clipper offers a sit down service and a mouth-watering menu with plenty of choice on every sailing including hot and cold breakfasts, a wide selection of filled sandwiches and baguettes, a choice of tempting desserts and a good selection of hot and cold drinks. 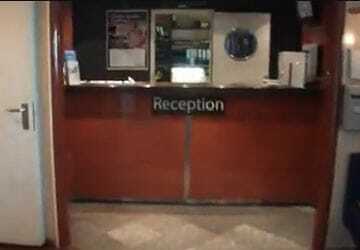 The Condor Traveller Bar offers a wide selection of soft and alcoholic drinks. 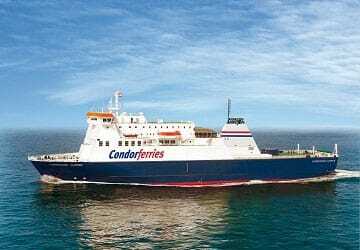 As the Channel Islands are treated as being outside of the EU you’ll be able to shop duty free onboard the Condor Rapide! You'll be amazed at the range of quality branded products available too including beauty, cigarettes & tobacco, confectionery, fashion accessories, fragrance, gifts, spirits, toys, games, travel essentials, wines and beers. Children can enjoy the viewing deck where they can watch the ferry pull away and make its onward journey. There is also a soft seated children’s area to keep them entertained throughout the journey where they can watch DVD's. Most seats are wheelchair accessible including the reclining seat lounges, which includes some seating with flexible armrests. There are also 2 cabins with disabled facilities which are suitable for use by wheelchair users. Please Note: Whilst we have taken great care in making our Commodore Clipper guide as accurate as possible, onboard facilities, services and entertainment may vary depending on the date and time of year that you travel, facilities mentioned may change without notification and ferry companies reserve the right to operate vessels other than those mentioned at time of booking without prior notification. Definitely the best way to arrive in Guernsey. Beautiful views of Sark and Herm and a real sense of arrival in historic St Peter Port. My brand new Mini Cooper arrived safely with me. Lots of space on the vehicle decks and easy to navigate. I absolutely recommend getting a cabin irrespective of the time of crossing. Comfortable berths with good bedding, tv and spacious ensuite. Exceeded expectations and made the whole experience very efficient as I was able to get work done too. This crossing was good value, compared with other ferry companies offering the same route on the same day. Just be aware that Commodore Clipper is not a mini cruise ship, it is a functional ferry which is why I suspect it can offer lower prices. We would use again if the crossing dates and times suit our plans. We've crossed the channel by ferry hundreds of times with practically every company available but this was our first with Condor. It definitely won't be our last. A clean ship, cheerful, friendly & efficient staff, good quality food and great value cabins/quiet lounges. We will book for next summer as soon as the crossing becomes available. 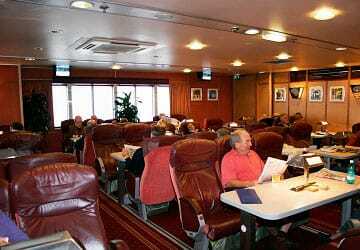 It is very comfortable travelling on this ship and the food served in the resteraunt is excellent, with a good choice and well cooked food. For the money this was a great little trip with our camper van. No frills but we did not want that for this short crossing. On and off the boat very quick, all staff very helpful and we parked on the deck and could watch our camper from the bar area. Excellent value for money at £140 return. Great service with brittany ferries to cherbourg , hassle free. I was moved from my booking from Portsmouth to Poole but despite one engine out on the ferry, I had a pleasant trip which was comfortable and I enjoyed it as usual. Can't complain at all; staff through all the changes excellent and kept me well informed. Think the reputation condor has at the moment is undeserved and if only they could control the weather their service would be fine. Excellent. Very smooth, helpful service and the all round view from the top deck bar is lovely. Took a while to get on board but the staff were really helpful and friendly. We booked reclining chairs in the quiet lounge - excellent for a 5 hour crossing! Nice and compact with all services right where we needed them - recliners, loos, food, shop. Food was good and service excellent. Loos were clean. Helped by a very calm crossing and travel bands, it was great to be able to easily go out on deck. Only criticism if any is the central seating area was far too hot and the crossing seemed very slow - but I got to read my book! This is the third successive year we have used this operator... condor ferries simply leave the rest in their wake! Excellent prices and very courteous staff. Spotlessly clean and everything you need on this compact and well appointed vessel. Friendly staff and good prices on board. I took a ferry from Portsmouth to Cherburgh and back having a car on board. Boarding was quick and easy, loading cars was amazingly organised and handled well. Staff were helpful and ferry left on time.